As a result of the fantastic early season snows, the Adirondack back country is in phenomenal shape for skiing. 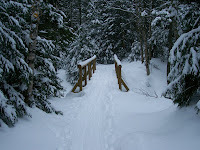 The Marcy Dam Truck trail is superb and all the ski trails out of the Adirondack Mountain Club's Heart Lake Adirondack Loj are beautiful skiing. However, an avalanche warning has been issued for the Adirondack Mountains. People who ski the Adirondacks know avalanches are rare here, but they do occur. The Christmas 2007 Blizzard dumped over a foot of snow here this past weekend, which created the avalanche conditions. Granted, there are some great slides to ski in the Adirondacks, but stay off of the them until the danger passes. For the time being, great skiing can be had on established back country trails, at the groomed cross-country ski areas (outrageously good) and at Whiteface Mountain. Skiing's great in New York State - especially when you practice safe skiing!